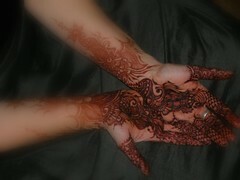 This is classical Indo-Arabic styled henna designed by Asha Savla. She is a world renowned henna designer based in Mumbai, India. She is one of my personal favorites, I often work on myself from her books. I am nearly satisfied with my line quality work, it could be better. That will come with time and practice. I am clearly obsessed with mehndi, so that is no problem. I haven’t been bored in I don’t know how long. I did my left hand one night, left my paste on overnight with a few lemon sugar sealants. It took awhile to rub it off the next morning, but I would never just wash it off with water. Too much detailed work in mehndi to not follow the aftercare rituals for dark stains. The next morning I did my right hand, I always start with my palms first. Because I was using my non dominate hand, it took much longer than my left hand did. I think it is a good brain and muscle control exercise. Also, I really don’t like having heavy mehndi only on one hand. Really. Light sangeet style on one hand does not bother me. I am trying to practice more complex designs, so that I may aquire some bridal clients this year. I am really enjoying this particular mehndi, I also did the tops, but the palms always come out with pomegranate and deep cherry tones.